Harmon Goldstone was pivotal in the formation of the New York City Landmarks Preservation Commission, serving as its chair from 1968-1973. People: James Felt, Geoffrey Platt, Robert F. Wagner, Jr.
Harmon Goldstone’s role in preservation was pivotal in the formation of the New York City Landmarks Preservation Commission (LPC). In 1960 he became President of the Municipal Art Society. A year later, Mayor Wagner appointed him to the Committee for the Preservation of Structures of Historic and Esthetic Importance (an early incarnation of the LPC). When Geoffrey Platt, the first chair of the Commission, stepped down from his post in 1968, Harmon Goldstone was named as his replacement as chair of the LPC. During his tenure at the LPC he voted against the Marcel Breuer additions to Grand Central Terminal, and was present during the 1973 amendments to the Landmarks Law. In 1961, while Harmon Goldstone was serving as president of the Municipal Art Society, Mayor Robert F. Wagner, Jr. named him to the Committee for the Preservation of Structures of Historic and Esthetic Importance. Mayor Wagner set up the committee under the influence of James Felt, to serve as a study committee to ensure the protection of important historic buildings and landmarks. The mayor had appointed Geoffrey Platt to head the committee. They worked with the Municipal Art Society and the Fine Arts Federation in order to come up with recommendations to the mayor for the preservation of historic buildings. This committee was a precursor to the Landmarks Preservation Commission (LPC).3 During his term, Goldstone observed that "by 1958, even prior to the informal hearings on the new zoning resolution, 10 percent of the buildings on the Municipal Art Society’s highly selective list had already been torn down. "4 It was clear to Goldstone that the Municipal Art Society alone did not possess the influence necessary to prevent the demolition of the buildings on its list. The recommendations made to Mayor Wagner included setting up a permanent Landmarks Preservation Commission that would designate buildings, landmarks, and districts of historic and architectural worth, and legislative measures that would enforce these regulations. In 1968, Harmon Goldstone succeeded Geoffrey Platt as chair of the Landmarks Preservation Commission. He was the first individual to receive a salary for this position. During his term, 7,271 buildings were designated as landmarks, and many historic districts were authorized, including 60 blocks of Greenwich Village, and 26 of SoHo. 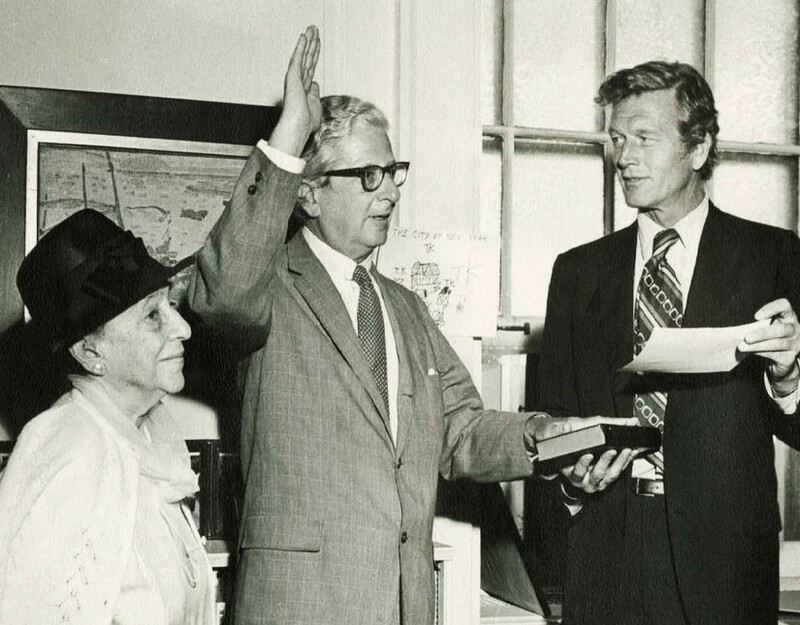 Goldstone was chairm of the Landmarks Preservation Commission at the time of the 1973 amendments to the Landmarks Law.6 The Municipal Art Society took on the issue and formed various committees to explore the idea of expanding the Landmarks Preservation Commission's powers. Goldstone recognized the need for added protections and supported the idea of amending the law, but faced with the realities of the LPC's limited staff and financial resources, he was reluctant to add too many new responsibilities to the LPC's purview.7 The law was eventually amended, giving the LPC the power to designate and protect interior landmarks and scenic landmarks. The amendments also instated continuous designation determinations, ending the moratorium that restricted designations to a six-month period every three years. Tape and transcript of the talk, "How the Landmarks Law Happened?" by Harmon Goldstone at the Century Club, 3 February 1972. Century Association Archives Foundation. The collections finding aid can be accessed here. Researchers should send inquiries via e-mail to [email protected]. Oral History with Anthony C. Wood, "Pioneers of Preservation: Taking the Long View: An Interview with Harmon Goldstone, the Second Chairman of the Landmarks Preservation Commission," Village Views Vol. IV, No. 3 (Summer 1987). Anthony Wood, "Pioneers of Preservation: Part II: An Interview with Harmon Goldstone." Village Views Vol. IV, No. 3 (Summer 1987). Charles Hosmer's Interview with Harmon Goldstone, 23 June 1982. Charles Hosmer papers, National Trust for Historic Preservation Library Collection and Archives, Special Collections, University of Maryland at College Park Libraries. A complete list of Hosmer's interviewees can be accessed here. Audio courtesy of the NYC Municipal Archives WNYC Collection. David W. Dunlap, “Harmon Goldstone Dies at 89; Led New Yorks Landmarks Commission,” The New York Times, 23 February 2001. Anthony C. Wood, Preserving New York: Winning the Right to Protect A City’s Landmarks (New York: Routledge, 2008), page 251. Gregory F. Gilmartin, Shaping the City: New York and the Municipal Art Society (New York: Clarkson Potter, 1995), pages 388-389. Municipal Art Society Minutes, Municipal Art Society Archives; Harmon Hendricks Goldstone Papers, New-York Historical Society. Anthony C. Wood, Preserving New York: Winning the Right to Protect A City’s Landmarks (New York: Routledge, 2008), pages 386-387.